So. Our challenge, Day 17, for the #zerotohero WordPress blogging challenge is to connect and publicize with social media, such as Instagram and Google Plus. I have inserted Instagram widget on this blog, but I choose not to connect the two otherwise. Instagram includes many family and fun items that may not pertain to my reflections; they will be connected through the widget only. I choose also not to connect Facebook: I have so many bad experiences with the Facebook changes. I once returned to my page to find all my photos had been turned open to the public because of recent updates to Facebook’s interface. To change them, I had to go to each photo to return them to the correct shared settings. That took time. I don’t appreciate that. So, while I check and post to Facebook (usually via Twitter), I don’t connect any app to it except Instagram, and then I choose what to post. The user should be in control, not Facebook. I also did not connect Twitter: I want to decide when and what to tweet, although anyone can tweet my posts, but that would be the reader’s choice. I really use twitter as a connector for projects, so my tweets are directed to hashtags that reflect those projects and connections. You see in my title that I included the hashtag — that way I can tweet to this community. I like that about Twitter. I did connect my Google Plus; I am connected to many educators in one circle, so it seemed appropriate to share and connect that way. We connect professionally and some personally, developing relationships as well as school projects. It’s truly a “community,” a neighborhood online. Sharing seems a good thing there. What about you? How did you decide which social media to connect with? 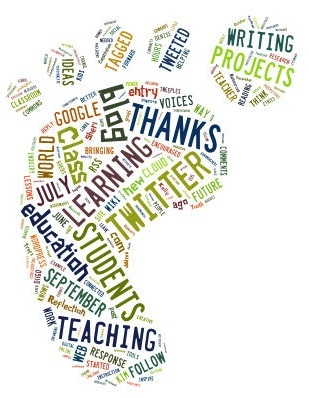 How do you choose where to leave your digital footprint, a path always returning to you? This entry was posted in About Blogging, Challenges, Consider, Personal and tagged social media, zerotohero. Bookmark the permalink. I chose not to link to any other social media sites, I had the same experience as you with private settings being changed to Public in Facebook. Thanks for sharing. It’s difficult to explain to the casual Facebook user about their settings. Most don’t realize they can choose or should choose according to their needs. Facebook takes advantage of them. Enjoy your day!